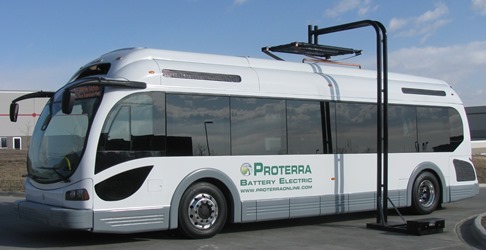 More than half of $55 million in grants announced Thursday by the Federal Transit Administration will be used to buy battery-powered buses and chargers made by Proterra in Greenville. The FTA distributed the money to 10 transit agencies as part of a program to deploy the cleanest and most energy-efficient transit buses made in the United States. Six of the award winners will use their money to buy Proterra buses or chargers, according to a list of the projects released by the FTA. Together, those transit agencies will buy 28 Proterra buses, seven charging stations and one charger, giving the Greenville company nearly $30 million worth of new orders. Proterra CEO Ryan Popple said the outcome was a "tremendous validation for the company." The program involved "intense competition for a lot of different technologies, but cities that specified that they wanted to deploy Proterra's technology did very, very well," he told The Greenville News. Popple said part of the new business came from new customers in Dallas, Texas; Lexington, Kentucky; and Duluth, Minnesota. The rest is repeat business from existing customers in Stockton, California; Louisville, Kentucky; and Worcester, Massachusetts, he said. Popple said it was too soon to say whether the new orders would prompt additional hiring at Proterra, which employs about 185 now at its plant and headquarters along Interstate 85. "What we're trying to figure out right now is how we slot in the orders," he said following a talk Thursday night at Clemson University's MBA school in downtown Greenville. Proterra employed about 30 when it arrived in Greenville from Golden, Colo., in 2010 as a startup company. The FTA said it received 50 project proposals for the funding round that together would have cost $200 million. Other companies benefitting from the awards announced Thursday include BAE Systems and New Flyer. U.S. Transportation Secretary Anthony Foxx, a former mayor of Charlotte, said in a news release announcing the grants that the "innovative, energy-efficient buses will help increase efficiency, improve air quality and reduce our nation's dependence on oil."